I've been sitting on this release for a while. Moloch (Ukr) is a band that I've featured sporadically over the last two years and I felt it was about time I featured this particular release. It features 18 of Moloch's oldest, rarest and most significant tracks from the last ten years of the band's existence. Some of these may have appeared on other releases in that time, but here they are gathered in one place. As with the majority of Moloch's previous releases, this compilation is made of a mixture of ambient and black metal tracks. After the haunting intro - Silence In The Pity, The cold harshness of Philosophie Der Depression is a stark reminder of the environment in which Moloch's sole member lives. It's an all-encompassing barrage of guitar, which doesn't seem to let up throughout its entire five minutes. Not so much a song, as an experiment in frequencies and dissonance! That barrage of noise dissipates with around a minute left and your left with choral melodies and depraved spoken word, which in Moloch's native tongue sounds even more harrowing. Ein Teil... sees the introduction of Moloch's fabled piano driven ambience, but only as an intro this time. That wall of guitar is back before you've had chance to breath along with those harrowing screams, which signal the first of his abject black metal hymns. Next up are Ein Dusterer Winter Kommt 1 and 2, which have been mentioned on this blog previously. They are both prime examples of how Moloch integrates his ambient influences with his heavier, black metal influences. It's close to Martial Industrial music is the way that the guitar is droning and resilient, but it stills contains those chilling moments of despair that you get from Satan's metal. There's some solace around the corner though, with the simplicity of Illusionen Eines Verlorenen Lebens and it's calming keys. That solace only lasts for a brief moment though, as the barrage of guitar re-awakens in the form of Depressive Visionen Eines Sterbenden Horizonts. It leads into another fear inducing black metal number. This section of Stiller Schrei Des Winters features some of Moloch's lengthier black metal hymns, especially the winding majesty of tracks 9 and 12, which both feature suitably long song titles. 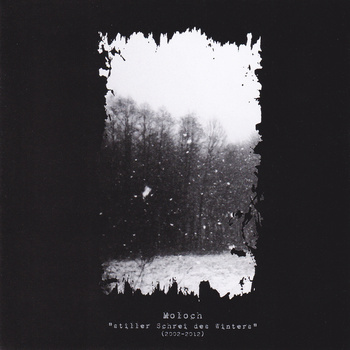 In between these songs, there is Das Leben Ist Wie Ein Verwundeter..., which takes Moloch's black metal writing style and condenses it into a shorter song. It's still no less harrowing though, especially with Moloch's anguished cries. Stille is a quick blast of haunting noise and spoken word, sometimes interjected by subtle instrumentation. There's no denying that this compilation requires plenty of attention from you as a listener, but as it twists it's way through malevolent evil and calming ambience, it really does impose itself on you in an ethereal way. The majesty of the sound that flows from your speakers and those guitars whirr into life and the despair you feel as Moloch cries and screams, really leaves you at the pits of your conscious thoughts, neither feeling positive or negative but with in a trance like state. E.Khu features the kind of white noise that only exists in your nightmares and Ljosalfaheimr follows this, which is that nightmare coming to a maddening crescendo. The closing section of the release is made of four short pieces, none lasting over 90 seconds. These are the final nails in the coffin as you are buried alive with the sound of this crazed ambient blackness imprinted deep into your synapse. Nothing will ever be the same after this! You can purchase is digitally or via CD from the above page too. You can also purchase it from Depressive Illusions Records at http://depressiveillusions.com/search/node/Moloch. Moloch can be found at www.moloch.com.ua and on Facebook at http://www.facebook.com/Molochukr.